Disinfection of the three-dimensional tubular root canal network is one of the prime objectives of root canal treatment. The use of mechanical instrumentation alone cannot sufficiently debride and clean this complex tubular network. Certain resistant bacterial species such as Enterococcus faecalis survive in areas of high pH produced by different irrigating solutions. This could be attributed to proton pump mechanism and their ability to form intra- and extra-radicular biofilms. Considering the weaknesses of common irrigants in root canal treatment, in recent years, new methods such as lasers have been introduced to effectively disinfect the root canal system. Combination therapy using various medicaments or irrigation solutions together with lasers has been reported to be more effective for canal disinfection. Among different types of the lasers, the diode laser is the most desirable type, due to the properties such as high penetration depth into the dentinal tubules and proper antibacterial effect.,, In this present study, the antimicrobial efficiency of different irrigating solutions against E. faecalis with or without the use of 980 nm diode laser is compared and evaluated in infected root canals. The study was undertaken in the Department of Paediatric and Preventive Dentistry, Surendera Dental College and Research Institute, Sriganganagar, Rajasthan, in association with the Department of Microbiology, Maharshi Dayanand College, Sriganganagar, Rajasthan. The study was conducted from September 2014 to November 2016. One hundred freshly extracted human single-rooted teeth were used as study samples with the inclusion criteria: teeth with single canal and closed apex; and exclusion criteria: teeth with external root resorption, root caries, root fracture, open apices, and any developmental anomalies. The teeth were divided into three experimental groups (n = 30) and one control group (n = 10). Each experimental group was further subdivided into two subgroups A and B (n = 15) designated as subgroup IA, IB, IIA, IIB, IIIA, and IIIB. The control group was also subdivided into two subgroups (n = 5); positive and negative controls. After access cavity preparation, working length was determined with K-file #15, and the root canals were prepared using the crown-down technique with ProTaper rotary instruments to an apical size equal to #40. A volume of 5 ml of 5.25% NaOCl and 17% EDTA, 1.2 ml of 2% CHX, and 2 ml of neem solution was used for irrigation in Group I, II, and III, respectively. All the root surfaces were covered with two layers of nail varnish and then transferred to a plastic cryotube, containing sterile brain heart infusion (BHI) broth. The E. faecalis (ATCC No. 29212, NCIM No. 5025) from the frozen culture was grown and maintained on BHI broth for use in the study. A 0.01 ml of the suspension was inoculated into each canal of experimental and positive control group (excluding negative control group) using a sterile insulin syringe. Then, the samples were incubated for 2 weeks under aerobic conditions at 37°C in plastic vials. The inoculum inside the canal was replaced for 7 days, and the viability of the E. faecalis cultures was checked with Gram-staining. After 7 days, the BHI broth inside the canal was dried. The samples were subjected to irrigation and subdivided according to respective groups. Group I: Subgroup IA and IB (n = 15) was irrigated with 5 ml of 5.25% NaOCl and 17% EDTA for 1 min without laser and with laser irradiation, respectively. Group II: Subgroup IIA and IIB (n = 15) subjected to irrigation with 1.2 ml of 2% CHX for 1 min without laser and with laser irradiation, respectively. Group III: Subgroup IIIA and IIIB (n = 15) irrigated with 2 ml Neem for 1 min without laser and with laser irradiation, respectively. Group IV: Neither irrigation nor laser treatment was carried out for both positive and negative control groups. Both the positive and negative controls with and without E. faecalis, respectively; were kept in incubator till they were used in the study. Laser irradiation was performed with diode laser with a wavelength of 980 nm using oscillatory technique, at a speed of approximately 2 mm/s for 5 s at 1.5 W. The laser treatment was repeated 4 times at intervals of 10 s each for each sample. For assessing antimicrobial efficacy, 100 petri plates were prepared, 90 were used for three experimental groups (n = 30) and remaining ten as control (five each for positive and negative controls). Thirty plates for each experimental group (Group I, II, and III), were further subdivided into 15 petri plates for each subgroup, respectively. A volume of 10 ml of UTI Hicrome agar was poured into each of Petri dish More Details, and the media was allowed to solidified. The dentinal shavings were collected from all the study samples using circumferential filing with reamer #40 for 20 s from the coronal, middle, and apical third. The sterile paper point no. #40 was used to collect the transfer fluid and dentinal chips. Then, it was transferred into a test tube containing 10 ml of sterile saline and vortexed for 20 s using vortex shaker. 50 μl of the vortexed saline was applied to UTI Hicrome agar culture plates and incubated at 37°C for 48 h. The cfu/ml for each plate was calculated using a bacterial colony counter by two different observers. The data obtained were evaluated and subjected to statistical analysis using Statistical Package of Social Sciences (SPSS) software version 20 (SPSS Inc., Chicago, IL, USA). The readings of microbial colony count by two different observers for all the experimental and control groups were subjected to Man–Whitney statistical analysis to evaluate the interobserver bias. The results obtained, indicated an insignificant statistical difference (P > 0.05). The Mean ± standard deviation (SD) of microbial colony count (cfu/ml) of positive and negative control groups was calculated [Table 1]. The mean ± SD of microbial colony count (cfu/ml) of all the six subdivided experimental groups was calculated [Table 2]. The order of bacterial colony count (cfu/ml) was observed as Group IB <IA <IIB <IIA <IIIB <IIIA [Figure 1]. Thus, the present study shows the order of antimicrobial efficacy as: NaOCl + EDTA + Laser >NaOCl + EDTA >CHX Gluconate + Laser >CHX >Neem + Laser >Neem. 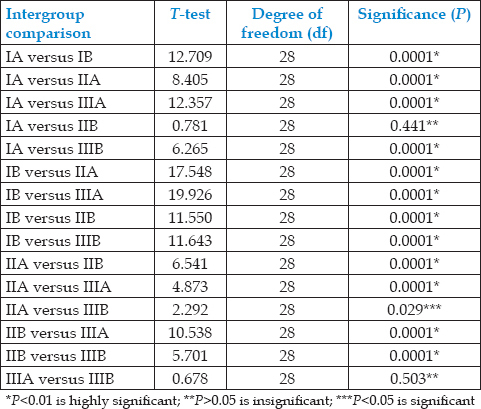 The t-test statistical analysis was used to compare and derive the significance between all the six experimental groups. The intergroup comparisons between Group IA versus IIB and Group IIIA versus IIIB were found to be insignificant (P > 0.05) whereas a significant relation was observed in the comparison of Group IIA versus IIIB. The intergroup comparison between all other groups showed a highly significant relation (P < 0.01) [Table 3]. The purpose of this study was to test the antimicrobial efficacy of various irrigating solutions (5% NaOCl + 17% EDTA, 2% CHX, and Neem) against E. faecalis with or without the use of 980 nm diode laser in infected root canals. E. faecalis is the most resistant species in the oral cavity and possible cause of failure of root canal treatment. In the present study, E. faecalis was selected, being the true endodontic pathogen and it is easy to culture, identify, and it rapidly invades the dentine tubules. Various antibacterial solutions have been used in treatment for irrigation of canals and as dressings in root canals between the appointments. NaOCl has a good antimicrobial effect, tissue dissolving capacity, and a low irritant effect on tissues. During instrumentation of the root canal, a smeared layer of inorganic matter is formed on the canal walls. NaOCl acts on organic matter but has very little effect on this layer, whereas it is efficiently removed by the chelating agent EDTA. Thus, irrigation with both NaOCl and EDTA solutions has been recommended to remove the organic matter and smear layer in the root canal. CHX has a bactericidal effect against a wide range of both Gram-negative and Gram-positive bacteria and is also fungicidal with low toxicity., Thus, 2% CHX had been used in the study as an irrigant solution, in a liquid presentation. Neem (Azadiracta indica) has antibacterial, antifungal, antiviral, antioxidant, anti-inflammatory, antipyretic, and analgesic effects without any side effect. It causes a maximum reduction in adherence of E. faecalis to dentin., Thus, in the present study, neem was used as one of the irrigating root canal solutions. Irrigating solutions have insufficient penetration depth, thus cannot destroy the microorganisms in the deeper layers. Diode laser has been used with promising results in relation to dentinal disinfection. Thus, in the present study, 980 nm diode laser along with various irrigation solutions have been used against E. faecalis. The most commonly used method in vitro for assessing antimicrobial efficacy of different irrigants along with laser irradiation is the Agar diffusion test. The antimicrobial efficacy of different irrigants is influenced with laser irradiation in the present study. The results of microbiological cultures in the 1st group indicated that 5.25% NaOCl + EDTA was more effective irrigating solution than 2% CHX and Neem. Similar results were obtained by Mehrvarzfar et al., who stated that the germicidal ability of NaOCl stems from the formation of hypochlorous acid when in contact with organic debris. CHX gluconate has been recommended as an irrigation solution because of its antibacterial effectiveness, substantivity, and lower cytotoxicity as compared with other irrigating solutions. Bystrom and Sundqvist indicated that the combined use of EDTA and 5% NaOCl solutions was more efficient than the use of NaOCl solutions alone. In the present study, the antimicrobial efficacy of three different irrigating solutions along with laser irradiation was more efficient against E. faecalis as compared with the groups subjected to irrigation protocol alone. The studies conducted by de Souza et al., Rajeshwari et al., and Gutknecht et al. support the result obtained from our present research. The wavelength of 980 nm in diode lasers had the strongest water absorption as compared to the other wavelengths of diode lasers; thus, most of the laser energy is absorbed in superficial dentinal tubule which is enriched with water resulting in effective antimicrobial action. The growth of E. faecalis was observed after 48 h as the metabolic activity of E. faecalis is maximum at 48 h, i.e., log phase for E. faecalis. The present study shown the order of antimicrobial efficacy as: NaOCl + EDTA + Laser >NaOCl + EDTA >CHX Gluconate + Laser >CHX Gluconate >Neem + Laser >Neem. For assessing the antimicrobial efficacy of lasers in root canals, further studies should be conducted in patients. The antimicrobial efficacy of NaOCl + EDTA + Laser was found to be maximum, followed by NaOCl + EDTA, CHX Gluconate + Laser, CHX Gluconate, Neem + Laser, Neem. Mehrvarzfar P, Saghiri MA, Asatourian A, Fekrazad R, Karamifar K, Eslami G, et al. Additive effect of a diode laser on the antibacterial activity of 2.5% naOCl, 2% CHX and MTAD against Enterococcus faecalis contaminating root canals: An in vitro study. J Oral Sci 2011;53:355-60. Briseno BM, Wirth R, Hamm G, Standhartinger W. Efficacy of different irrigation methods and concentrations of root canal irrigation solutions on bacteria in the root canal. Endod Dent Traumatol 1992;8:6-11. Moritz A, Gutknecht N, Goharkhay K, Schoop U, Wernisch J, Sperr W, et al. In vitro irradiation of infected root canals with a diode laser: Results of microbiologic, infrared spectrometric, and stain penetration examinations. Quintessence Int 1997;28:205-9. Schoop U, Kluger W, Moritz A, Nedjelik N, Georgopoulos A, Sperr W, et al. Bactericidal effect of different laser systems in the deep layers of dentin. Lasers Surg Med 2004;35:111-6. Meire MA, De Prijck K, Coenye T, Nelis HJ, De Moor RJ. Effectiveness of different laser systems to kill Enterococcus faecalis in aqueous suspension and in an infected tooth model. Int Endod J 2009;42:351-9. Ohara P, Torabinejad M, Kettering JD. Antibacterial effects of various endodontic irrigants on selected anaerobic bacteria. Endod Dent Traumatol 1993;9:95-100. Spratt DA, Pratten J, Wilson M, Gulabivala K. An in vitro evaluation of the antimicrobial efficacy of irrigants on biofilms of root canal isolates. Int Endod J 2001;34:300-7. Jhamb S, Nikhil V, Singh V. An in vitro study of antibacterial effect of calcium hydroxide and chlorhexidine on Enterococcus faecalis. Indian J Dent Res 2010;21:512-4. Chandrappa PM, Dupper A, Tripathi P, Arroju R, Sharma P, Sulochana K, et al. Antimicrobial activity of herbal medicines (tulsi extract, neem extract) and chlorhexidine against Enterococcus faecalis in endodontics: An in vitro study. J Int Soc Prev Community Dent 2015;5:S89-92. Vinothkumar TS, Rubin MI, Balaji L, Kandaswamy D.In vitro evaluation of five different herbal extracts as an antimicrobial endodontic irrigant using real time quantitative polymerase chain reaction. J Conserv Dent 2013;16:167-70. Anjum MG, Sujatha I, Chandra SM. Antimicrobial efficacy of various irrigating solutions on E. faecalis in root canals: An in-vitro study. Int J Appl Dent Sci 2015;1:94-7. Rajeshwari, Kamath PR, Kundabala M, Shenoy S, Hegde V, Thukral N. An evaluation of horizontal depth of penetration of various irrigants into the dentinal tubules when used alone and in combination with diode laser: An in vitro study. J Interdiscipl Dent 2014;4:130-4. Gutknecht N, Alt T, Slaus G, Bottenberg P, Rosseel P, Lauwers S, et al. A clinical comparison of the bactericidal effect of the diode laser and 5% sodium hypochlorite in necrotic root canals. J Oral Laser Appl 2002;2:151-7. Morandi S, Brasca M, Alfieri P, Lodia R, Tamburini A. Influence of pH and temperature on the growth of Enterococcus faecium and Enterococcus faecalis. Le Lait 2005;85:181-92.